Unlike my amazing colleagues who have spent decades studying orangutans and their conservation, I am a relative newcomer to the field. I am a trained ecologist interested in questions revolving upon the mechanisms animals use to obtain and utilize the energy that is necessary for survival. Upon completing my Ph.D. in Ecology and Evolution, I was fortunate enough to have the opportunity to work with Dr. Carel van Schaik and Dr. Maria van Noordwijk, two primatologists who have dedicated their careers to exploring orangutan behavior and conservation. I’d spent my prior years studying dietary ecology of capuchin monkeys in Costa Rica, so the transition from a relatively easy field site in Costa Rica to the lowland peat-swamps of Central Kalimantan, Indonesia was exciting, yet shocking at the same time. I began my journey studying orangutans in 2005 at the Tuanan Orangutan Research Station as part of the Tuanan Orangutan Research Project (TORP). This station was started in 2003 to deepen the understanding of the effects of habitat degradation on orangutan behavior and to increase knowledge of orangutan behavior in general. The Tuanan Orangutan Research Station was established as a joint effort between Dr. Carel P. van Schaik (Duke University / University of Zurich), Dr. Suci Utami Atmoko and Drs. Tatang Mitra–Setia of the Universitas Nasional Jakarta and the Borneo Orangutan Survival Foundation (BOSF) Mawas Program. You may ask – why is this field site important? Why should we focus our efforts on a selectively logged, peat-swamp forest? 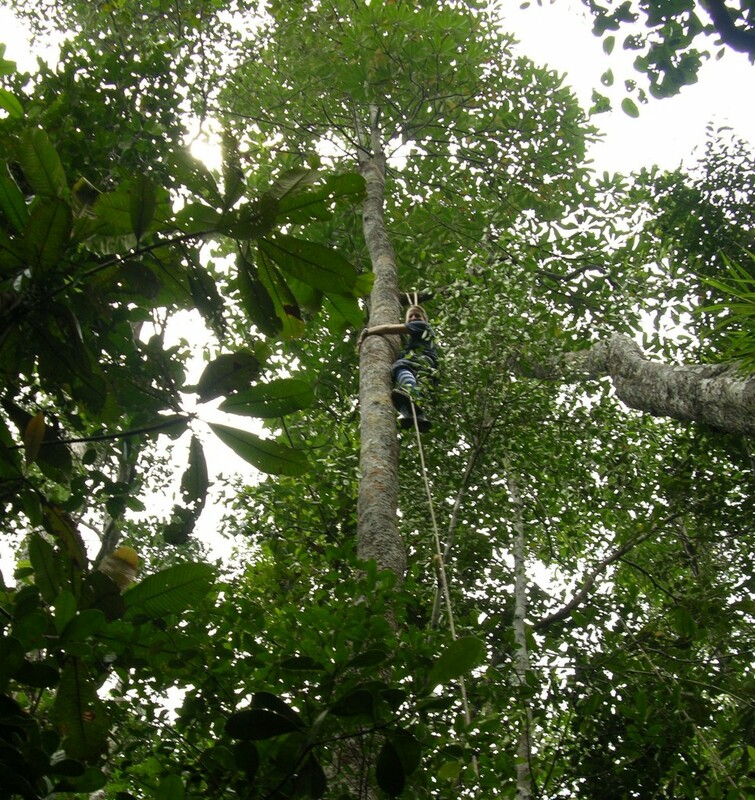 Initial surveys within Mawas indicated a relatively high density of orangutans. 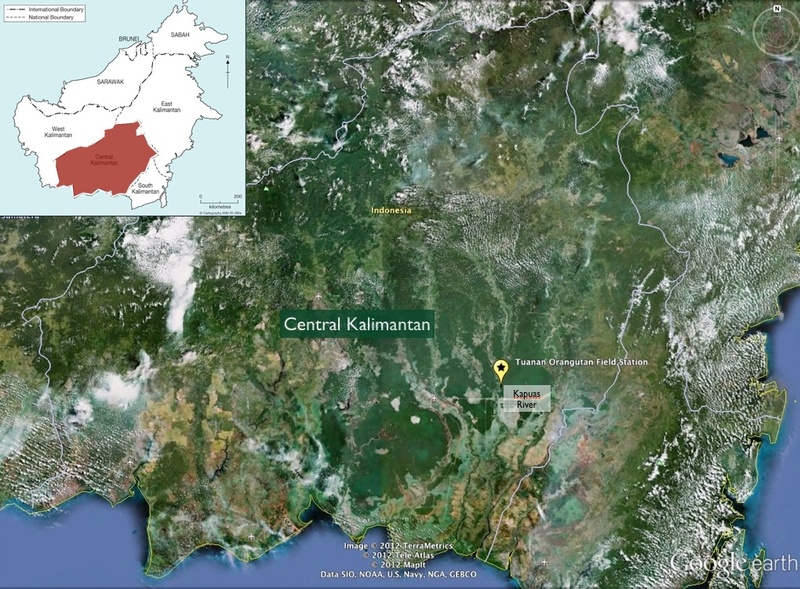 A more formal survey later confirmed orangutan density around the Tuanan research area of between 3.84 and 4.71 individuals/km2, a figure well above densities reported from other field stations in Central Kalimantan. For example, orangutan density estimated at Sebangau National Park, located approximately 70 km from Mawas, is reportedly 1.82 individuals/km2. In this essay, I discuss why these sites are important for conservation efforts, some of our research discoveries at Tuanan, and our recently established environmental education programs at schools surrounding the research area. For the last few decades, preferred habitats of wild orangutans – the alluvial plains along major rivers and peat swamps – have been substantially reduced as a result of human exploitation for agricultural mono-crops, specifically the establishment of oil palm plantations. Unsustainable land use practices have resulted in the fragmentation of unprotected orangutan habitats and have led to fatal consequences for orangutans..
Deforestation rates continue unabated in unprotected areas of Kalimantan and are currently estimated to be above 1.5-2% per year. Experts predict that without intervention and strong policies to prevent further deforestation, orangutans could potentially become extinct from the wild within a few decades. It’s well known that the peat-swamp habitats preferred by orangutans are also major sources of carbon storage. The soil carbon content found in peatlands globally is estimated at slightly less than all the carbon that exists in our atmosphere today. Given that 60% of all peatlands are found in Indonesia and a large majority of those are in Kalimantan, it is naturally an important area to focus conservation efforts. Unfortunately, over the past two decades, human development activities including draining, burning, and deforestation of pristine habitats have converted these carbon-sinks into major carbon sources. The Mawas area has thus far been saved from conversion to oil palm, despite strong pressure from the commercial sector. The area is estimated to provide habitat to approximately 3,000 wild orangutans. In 2009, the National Strategy and Action Plan for Orangutan Conservation (NSAPOC) emphasized the importance of focusing conservation efforts in areas that are yet to be designated as conservation areas. Approximately 75% of wild orangutans continue to survive in production forests, which are managed by various forest concessionaires. The Mawas area is currently gazetted as a production forest which does not provide long-term protection. Orangutans can survive in selectively logged or commercialized natural forests, which have been under competent and responsible management. Indeed, many populations continue to survive under these conditions throughout Sumatra and Kalimantan. However, sustainable orangutan conservation within these landscapes is not possible without the support and direct involvement of local community members. One of the major problems faced in Central Kalimantan is that the local community members are unaware of the environmental impacts of development both in terms of their own long-term welfare, and that of the surrounding wildlife populations including orangutans. I established a long-term research project in 2005 at Tuanan focusing on orangutan dietary ecology and cognitive foraging decisions. This project combines field observations with laboratory techniques to examine the relationships between nutrition, gut physiology, health, food availability, and diet selection. Specifically, I am interested in behavioral, physiological, and morphological adaptations to periods of fruit scarcity in wild orangutans. For example, I am examining how the mechanical and nutritional properties of foods consumed by wild orangutans vary with the availability of preferred fruit. I’m combining these data with ranging and tree visitation data to test if orangutans are energy-efficient foragers, to better understand how they cope with periods of fruit scarcity. We have found that when fruit is scarce, orangutans switch from a diet of preferred fruit to one of leaves and bark that are much more difficult to process both orally and digestively. We’ve examined the mechanical properties of these different foods items and found that when fruit is scarce, the amount of time chewing and processing food is much higher because these items are so tough. At Tuanan, the orangutans clearly respond to the availability of ripe fruit. We’ve discovered that they change their foraging strategy. When fruit is scarce, they reduce the amount of time spent traveling between food patches and spend longer periods of time feeding in one area. To compensate for reduced caloric intake, they also seem to reduce energy expenditure. This results in them visiting fewer feeding trees when fruit is scarce. We’ve also found that while orangutans in other dipterocarp forests produce ketones (indicators of fat metabolism) in their urine more often when fruit is scarce, at Tuanan, a peat swamp forest, orangutans produce ketones much more often – indicating they are nutritionally stressed year round. As far as we know, orangutans are the only documented species of apes (other than humans) in the wild that store fat and use these fat reserves when preferred fruit is scarce – this also coincides with periods of low caloric intake. However, it may be that the use of fat for energy simply has not been detected yet in other species. The environment in Borneo is stressful. The soil is not very fertile and plants fruit unpredictably, only producing large quantities of fruit every three to six years. When the trees do bear fruit, the whole forest produces at once. The animals gorge themselves, put on fat, and then use these reserves for the next two to four years while they feed on lower-quality food items. Due to their large size and unique locomotion, this additional fat does not seem to hinder them. Thus, this fruiting pattern may have exerted a selective pressure on their ability to utilize fat deposits and maximize protein assimilation from difficult to process foods during these periods of fruit scarcity. We are now investigating this more closely by examining physiological responses to variation in fruit availability. Specifically, I am investigating urinary gut peptides that are produced in response to the presence/absence of relevant nutrients in the gut and have been linked to hunger and satiation. We are exploring if levels fluctuate with preferred food availability. These techniques, combined with additional colorimetric assays from urine samples, provide an innovative approach to understanding variation in feeding strategies and protein balance among wild primates, and they have strong implications for monitoring the health of orangutans that are currently being released into the wild. We are also combining these methods with the examination of biological markers of inflammation in the urine to examine seasonal variation in orangutan health. Once we establish and verify these methods, we plan to work closely with BOS-F to monitor these indicators of stress in rehabilitated and released orangutans. People often ask me how we collect urine samples from orangutans up in the trees. Dr. Cheryl Knott (Boston University) has perfected these methods. We typically collect urine samples as soon as the orangutans leave their nests in the morning. Just like humans – when they wake up they are ready to empty their bladder. We collect urine either by spreading out plastic sheets under the nest, using a plastic bag attached to a stick, or my favorite – the inverted umbrella (it really does work). Because orangutans in Borneo reproduce on average only once every eight years, it is hard to obtain life history data on this species without studying a particular population for decades. Female orangutans at Tuanan seem to follow this trend, giving birth every 8-9 years and weaning offspring when they are 6-7 years old. 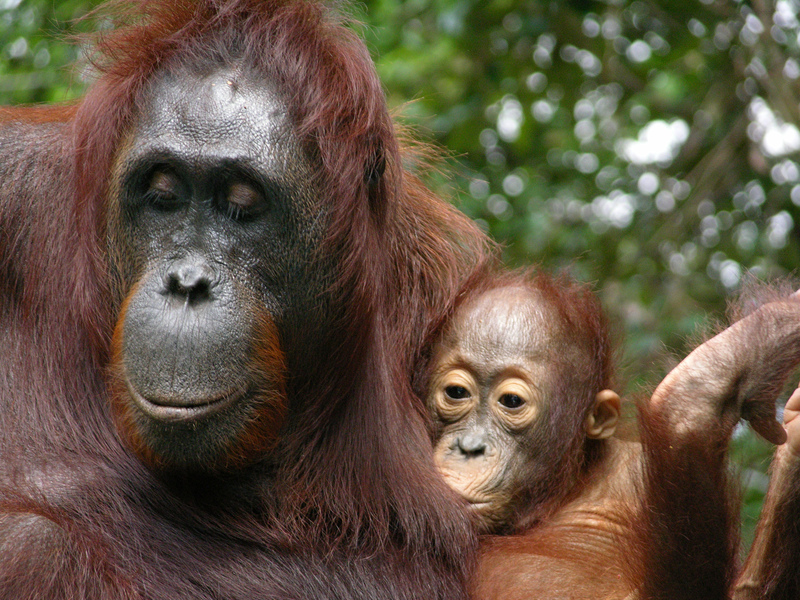 However, using genetic techniques, Dr. Michael Krützen (University of Zurich) and his group have been able to examine related among individual orangutan females at Tuanan. One of several of their findings is that one of our adult females, Jinak, has given birth to at least five offspring, with her most recent born in 2011. Thus, if Jinak had five offspring with an interbirth interval of eight years, that means she has been giving birth for at least 40 years. Given that orangutans do not generally have their first offspring before 10-12 years of age, she could be as old as 52 years (if not older) and just gave birth to a healthy baby. That’s amazing! This is just one of many reasons why it is so important for us to stay at these field sites and continue to study individuals that we can identify. In my short time working in Kalimantan, I’ve observed how horribly those destroying the habitat can treat the orangutans. At Tuanan I clearly remember coming out of the forest at 6:00 PM after an 11-hour follow of a female (Juni) who had just given birth for the first time (to Jip). It was an amazing day, but when we got to camp one of our field assistants informed me that there were some men down in the local village who wanted to talk to me. My assistant informed me that they came up river from an illegal logging concession with two young orangutans and that they wanted me to buy the orangutans. I showered, got dressed quickly, and radioed to the BOS-F station about our situation. They contacted Nyaru Menteng – the orangutan rehabilitation center run by BOS-F – and told us that they would have a veterinarian and rescue team at Tuanan within the next eight hours. They instructed me not to pay for the orangutans, as this would encourage the killing of more orangutans in the future. Four of us then walked to the village to meet the loggers and the orangutans. When we got there, the orangutans were still in the boat. It was cooling down for the night so we asked the loggers if we could bring the orangutans inside a villager’s house. One orangutan was probably about four-years old and was in a wooden crate. The other was just an infant – less than a year old. I asked the loggers how they acquired the orangutans, and they told me that the mothers abandoned them so they “rescued” them in the forest. After watching orangutans in the wild, I knew this could not be true, as a mother orangutan would never abandon her infant and always keeps a watchful eye on her offspring. I knew that whoever had captured these infants did so by killing the mother first, as is the fate of so many young orangutans that are brought to rehabilitation facilities like Nyaru Menteng. In the end, we did not pay the loggers. We were polite, we gave them tea and food, and they left us with these young, frightened, hungry orangutans. We had about eight hours until the rescue team arrived and we knew we had to try to rehydrate these poor animals. 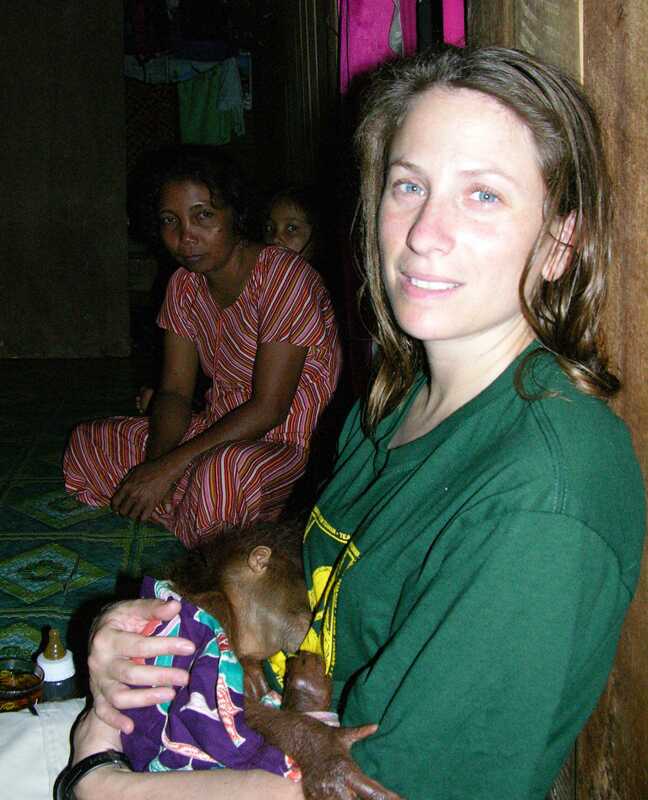 One of the locals in the village had a bottle, so we fed the infant orangutan milk. The older orangutan was in a crate, and we decided not to remove it because we were afraid he would escape or potentially bite someone out of fear. We gave him water, grapes, and bananas through the wooden crate, which he ate. Soon after, he was asleep. We held the baby until the rescue team arrived. At one moment, as I held this young infant in my arms, I thought about his lost opportunity – that he would never be with his mother again and he would never experience the bond between mother and offspring that I had just observed in the forest that day with Juni and Jip. It was then that I knew I would try to make a difference, to try to combine my research with conservation and try to help teach the people surrounding the research area about orangutans, conservation, and the importance of their habitats. Research and exploration has always been a strong passion of mine. It was not until I started working in Kalimantan and was surrounded by so many scientists and biologists that I began to focus my efforts towards conservation-oriented activities. While research remains my strong focus, I’ve come to realize that without conserving the habitats of these amazing animals, they will not be here for future generations. It took a few years to obtain funding, but in 2010 we received a grant from the United States Fish and Wildlife Service’s Great Apes Program to start a program titled “The integration of environmental education and long-term research to increase conservation awareness in communities surrounding the Tuanan Orangutan Research Station, Mawas Area, Central Kalimatan.” This project is a joint effort between Rutgers University, Universitas Nasional Jakarta, and BOS-F. The goal of our project is to support orangutan conservation surrounding the Tuanan Orangutan Research Station by implementing an environmental education program within the surrounding communities, while continuing our current research project. By developing an environmental education program within the local school system and the general community coupled with the continuation of involvement of local community members within our research project, we are increasing public awareness on the immediate threats to biodiversity in the surrounding forest. Further, by providing the local schools and communities with basic information on orangutans, the peat forest, and environmental issues, we are increasing the awareness among local peoples of the biodiversity within the Mawas area and the importance of its long-term conservation. Through our active involvement with the local community, we are building a solid foundation for the sustainable conservation of the orangutan population within this region. 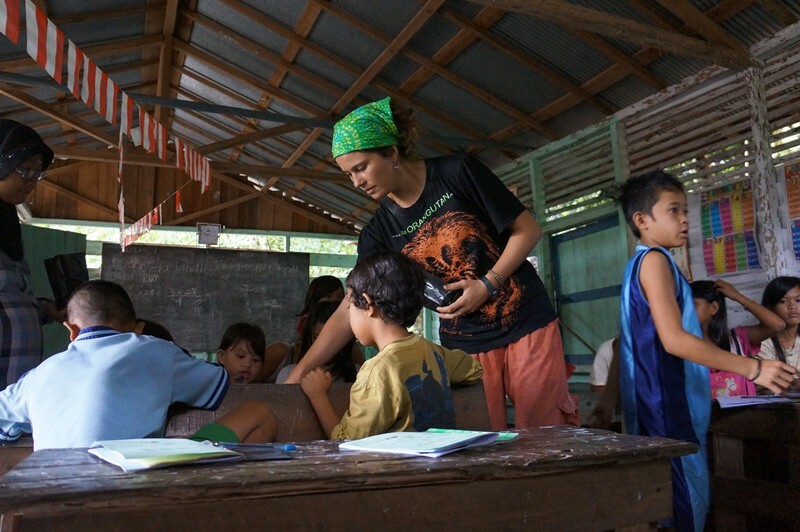 The thee main objectives to achieving our goal are to develop a curriculum of environmental education activities and field trips within the local school system, further build relationships with three local communities, providing them with up-to-date information on our research findings at the Tuanan Field Station and current environmental issues that directly affect their livelihoods, and to continue to integrate local community members within our current research efforts at the Tuanan Research Area. 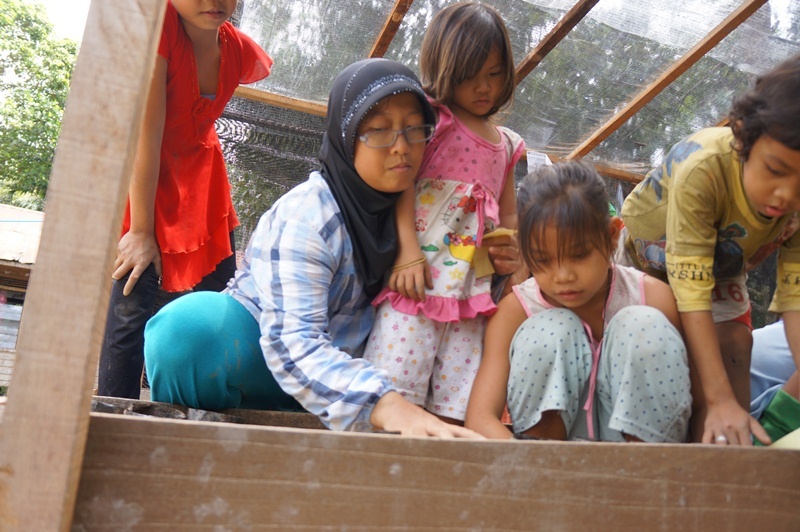 This is an ongoing project, but we’ve already successfully introduced the environmental curriculum into two schools along the Kapuas River and are currently starting with one additional school. The children, their parents, and the communities have embraced this program, working together to help us build greenhouses at each school and install water pumps. The community provides advice and suggestions about the lessons and projects we are doing with the students. We work closely with the local schoolteachers and community leaders to make the program beneficial to everyone. Watching the children’s excitement over planting, nurturing, and measuring the trees that they will plant in the future has been so rewarding. The students learn about the function of peat and the water cycle, the biology of the primates in the forests, and climate change in general. In these pictures, it is clear to see the excitement and commitment of the students, staff, and all of the teachers involved in this program. To follow the success of our program, please visit our website (http://rci.rutgers.edu/~ev140/TORP/Welcome.html), which we will update this summer. It is projects like this, the recent releases of the orangutans by Nyaru Menteng, and all of the dedicated work by orangutan biologists that keep me positive that we can maintain viable populations of orangutan and save this endangered species from extinction. 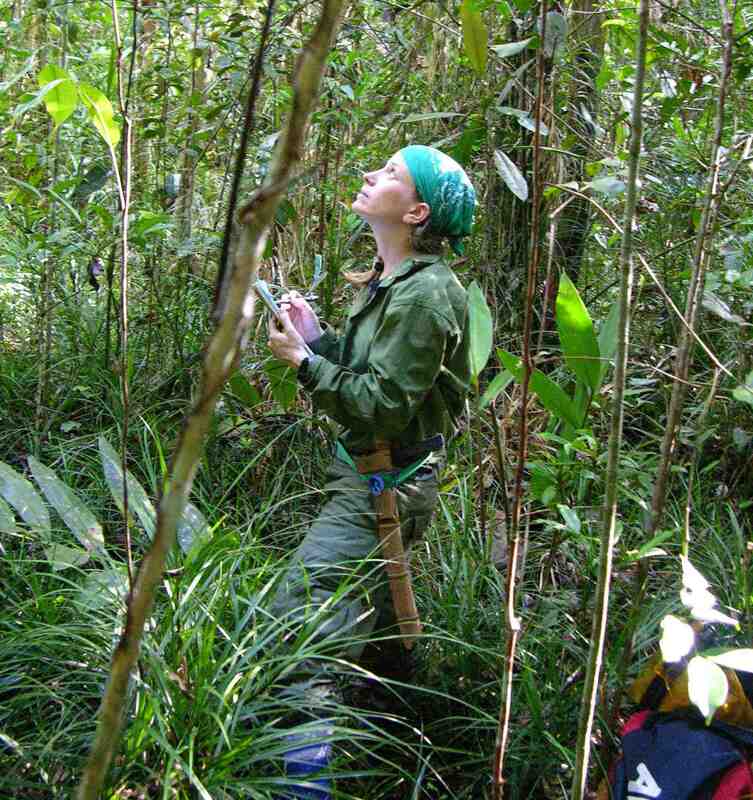 Dr. Erin Vogel is an ecologist and evolutionary anthropologist who has studied foraging behavior in a variety of organisms including insects, birds, and primates. Her research interests cover a broad array of topics that revolve around the central theme of how and why organisms acquire and select the food resources they need for survival. She studies how ecological variation influences the behavior, social organization, and morphology of non-human primates and early hominins. Dr. Vogel is currently an Assistant Professor in the Department of Anthropology at Rutgers University. She co-directs the Tuanan Orangutan Research Project with Dr. Maria van Noordwijk in collaboration with faculty from Universitas Nasional Jakarta. Acknowledgements: Erin would like to thank all of the researchers that have welcomed her into this community in 2005 and advised her on her research and conservation efforts: Carel van Schaik, Maria van Noordwick, Suci Utami Atmoko, Tatang Mitra Setia, Serge Wich, Anne Russon, Odom Kissar, Cheryl Knott, Andrew Marshall, Ian Singleton, Meredith Bastian, Jito Sugarjito, Simon Husson, Helen Morrogh-Bernard, Mark Harrison, and Susan Cheyne. In addition, she would like to thank the Tuanan research team of dedicated field assistants, staff, and students, BOS-F, and sources of research funding (The National Science Foundation, The Denver Zoological Society, The L.S.B. Leakey Foundation and USFWS). This article was edited by Tom Mills of the Orangutan Conservancy. All photos are courtesy of Dr. Erin Vogel. To learn more about how you can help the Orangutan Conservancy please visit our how to help page. Thank you, Tom & OC, for sharing this fantastic article about Dr. Vogel’s work in Indonesia. I enjoy reading her own accounts of the field work she does regarding food selection/availability, to better understand how orangutans manage with environmental change. And of course, the orangutan rescues are of particular dramatic appeal! I empathize here, having fostered a bush-meat orphan infant chimpanzee for several months in 2009… a bittersweet & truly unforgettable experience. It’s not easy working in the trenches, going without the luxuries & conveniences of “modern” life. I suppose that’s the very reason for its appeal, though. May Dr. Vogel’s passion continue to fuel her good work for orangutans & other species through educational programs available to the locals, in hopes of building appreciation for their invaluable wildlife & rainforests. Thank you Lisa. I’ll make sure Dr. Vogel sees your kind comments. Your article is fantastic. Thanks for sharing. I really like the details of your work mentioned and how you and your group are addressing the environmental education of the “locals”. For me it is a must to do. You are conducting an excellent work. Hope to hear more about your work/activities . Good luck and further success! thank you for your comments and your very kind words. It is amazing to see how the kids really love the environmental education program and how much the communities have embraced it. I hope we have the funds to continue the project for a long time – that is what is most important! We are working on it! I am fortunate to work with several amazing orangutan researchers at Tuanan – it is a wonderful site and the community support we have is great. I look forward to working there for a long time. I will start updating the web page with new pictures of our progress, so please check back in with us! Unfortunately, we recently had another baby orangutan brought to camp – he was in good health and BOS-F Nyaru menteng came for him, but once again it is very sad to see this happen over and over. I hope we can change this. Your important work and rich life are incredible examples I wish to emulate. As a zookeeper of Orangutans I struggle with the hope/reality that their wild brethren can some day see the effects of their life as proponents for a species. The information that researchers like yourself provide for us in the zoo world allows for a dialogue with our patrons and fellow professionals in order to be the best champions for Orangutans as possible. I sincerely wish you the best of luck on your work and I hope to soon find a professor with whom I may further my education and continue similar profound research to shed even brighter light on these amazing individuals. I must say your article is resourceful and a motivational tool to every one involved in primate conservation be great apes or other related primates species. I live in Cameroon and have worked with a conservation organization involved in Cross River gorilla and P t ellioti conservation for 4 years but never had the opportunity to meet with a researcher who has studied wild orangutans. I have always watched this beautiful creatures on the internet and the television and had very little knowledge on their ecology. Your article has given me an insight into the ecology of this beautiful creatures, the conservation strategies adopted, the challenges encountered which are similar with respect to other primate conservation efforts and the approaches adopted to meet with these challenges. Continue with your good work as it is the work of many primatologist like yourself that makes the word Exticntion “extinct in itself”. Thank you all of you for your comments and kind words. We are working hard trying to keep these programs going. Christina, please feel free to contact me for any advice you may need pursuing your dreams!